With the twenty-first century now well under way, we can definitely state that painting is not fashionable any more. Painting has been invaded by a plethora of different media that have been inserted often indiscriminately by the arrival of new technologies. Some artists have preferred having more immediate contact with their spectators via performances or happenings, for example. Within this panorama, perhaps the best news coming out of Cuban art today has been the devotion and seriousness demonstrated by a group of our youngest and most talented artists, in particular, Alejandro Campins, born in 1981 in the southern seaside city of Manzanillo in eastern Cuba. Alejandro Campins has become well-known for his mastery of large paintings and his impressively serious attitude, almost classical, about the act of painting. In spite of being a relative newcomer to the Cuban art circuit,. He has been invited to participate in important group shows that have represented Cuba in the world. Some of these are The New Painters (2013) and Cuba (2012), Salt Fine Art Gallery, Laguna Beach, USA; CubaContemporaine. Arte de la grande ile des Caraibes (2013), Centre Culturel du Manoir de Cologny, Geneva, Suiza; Gulliver (2012), Freies Museum, Berlin. Germany; Art Position 11 (2011), Halle Nautic Technic, Salavaux, Switzerland; Junge Szene Kub (2011), Pasinger Fabrik Cultural Center, Munich and Staedtischen Museums, Traunstein, Germany; 12th Cairo Biennale (2010), Egypt; Artbo (2010), Bogota, Colombia; 1st Biennale of Portugal (2010), Portugal; and Text to Speech: El otro Lenguaje. ContemporaneaCuba 2010, Bonelli LAB, Canneto Sull’Oglio, Mantua, Italy. Some of Alejandro Campin’s pieces are an intelligent dissertation about space. In this space, he composes objects that are consistent with the surroundings, although other may suggest a rupture with the environment. These dialogue as they can amongst themselves via the artist’s fantasy. At times, Campins alludes to situations and behaviors that are beyond the common behavior of western man. His paintings become metaphors that capture and synthesize experiences of beings that arise with the growth of their souls enjoying the benefits of profound meditation. The title of Campins’ one-man show in 2012 at the Factoria HabanaGalleryis very significant: Patria [Homeland], a word that has been over-used and often sequestered by ideologies. The homeland Campins shows us in his five large canvases is the homeland recovered from within—that symbolic space which is totally freed of all its poisons and placed there in order for us to seriously start thinking about it. 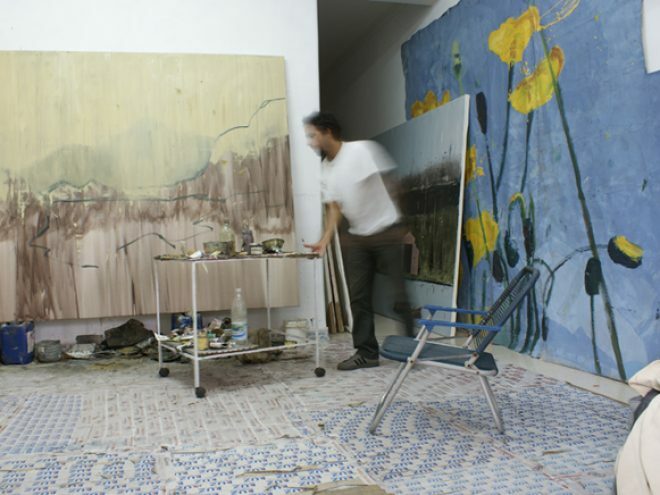 Despite his youth, Campins has several one-man shows under his belt: In 2013: Nómada, Liceo Carmelita, C. del Carmen, Mexico; Herencia Galerie Knoerle & Baettig, Winterthur, Switzerland; Reliquia, Raymaluz Art Gallery, Madrid, Spain; Li4, ZONAMACO, Mexico City; 2012: Patria, Factoría Habana, Havana, Cuba; (2011): La bondad del desconocido, Galería Servando, Havana, Cuba; 2009: En la cola del cometa, Galería Luz y Suárez del Villar, Madrid, Spain; Cuando el sol es enorme, Galería Servando, Havana, Cuba; 2008: Proyecto Inventario, Fundación Ludwig, Havana, Cuba; Corta Distancia, Casa de la Cultura de Plaza, Havana, Cuba; 2000: Con ideas que se interrogan, Centro de Arte, Holguín, Cuba. He has demonstrated his indisputable talent very clearly in every show—what he delivers comes from body and mind working intensely together.